Your social media presence deserves the same level of attention you give your brand in other outlets. Because the human brain reacts so immediately and viscerally to visual information, it’s essential that your social media content—from profile pictures to daily posts—be designed to have the greatest possible impact. Symmetri creates social media content with visual design and language that engages your followers while remaining true to your brand. 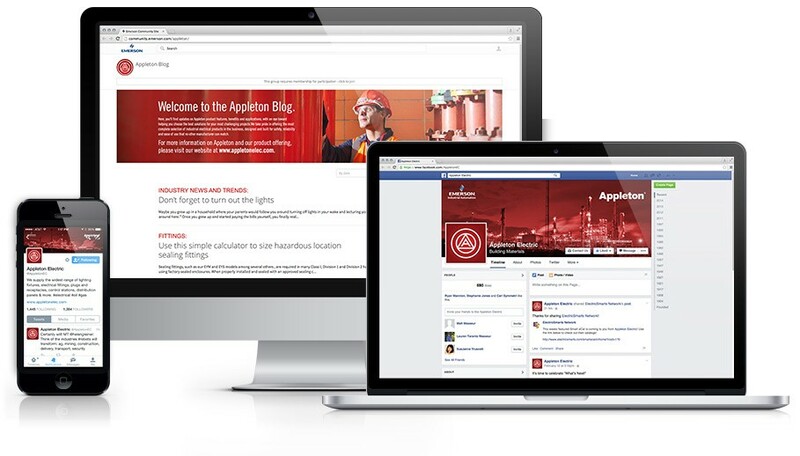 The Appleton brand uses social media to connect with engineers, reinforce technology leadership, differentiate its brand in the marketplace, and support distributors with content for their reps.
Symmetri helped Emerson launch the Appleton blog and developed a strategy to produce and promote content through social media. Facebook, Twitter, YouTube and the Appleton Blog share a consistent look and a consistent voice. Visuals incorporate “Appleton Red” and most images show engineers working in harsh environments, the places where Appleton’s products can most often be found. Every post and tweet emphasizes Appleton’s knowledge of the industry, proving their leadership position. In a year's time, sessions on the Appleton blog increased 11x and total social fans increased by more than 128%.